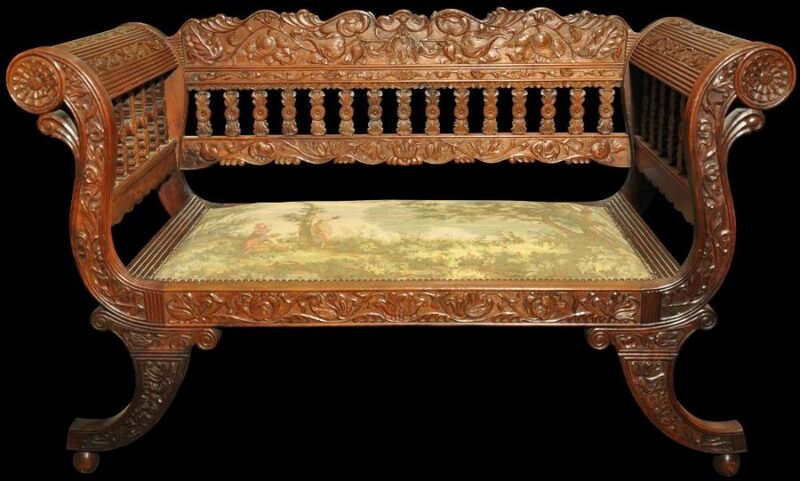 This splendid two-seater settee is of late Regency form but carved with typically Galle District Ceylonese scrolling foliage and flower motifs. The settee comprises a wavy toprail; an open-work, carved splat; prominent, scrolling arms carved with reeding and panels of vines and flowers; and similarly carved splayed legs on ball feet. The wood is light coloured and possibly is teak.Sina malaandkatira mala flower motifs are among those employed in this piece. The seat is upholstered with a machine-made European embroidered scene. The wood on the underside is impressed with two sets of numbers: ‘10464’ and ‘A 2192’. The form of the typeface of the numbers impressed is consistent with a circa 1840 dating. The wood and polish has a fine patina, particularly on the scroll arms. The settee is in near-perfect condition. There are no losses to the carving. The frame is firm, robust and stable. Typically such furniture items could be ordered from furniture dealers in Colombo who in turn commissioned pieces from carpenters located in the cabinet-making centres of Galle and Moratuwa. Items were made for British colonial administrators and merchants on the island who had them shipped back to England at the end of their posting. See Lot 188 in Sotheby’s London ‘Exotica: East Meets West 1500-1900’, May 25, 2005, for a related settee of carved ebony. van de Geijn-Verhoeven, M., et al,D omestic Interiors at the Cape and in Batavia 1602-1795, Waanders Uitgevers, 2002.